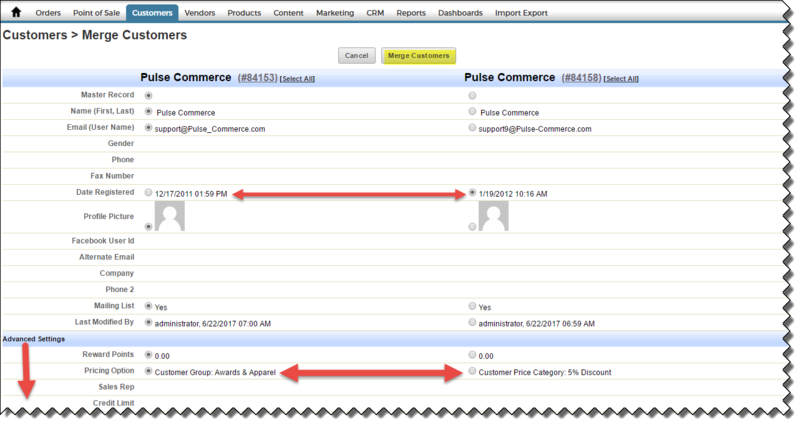 You can merge customer records together by using the Find Duplicates action inside a customer record (Customers > View Customer). By default, the system will look up all customers with the exact same first and last name. You can change and edit the criteria to search for other customer records to merge. Once you have found a duplicate customer entry select Merge. The system will compare all relevant items for the two customers, and allow you to select which detail will be retained when the two records merge. Additional items tied to the customer record (wishlist, etc.) will all be retained by the Master Record. Note: Some details, such as credit cards saved via the wallet functionality cannot be saved from the additional account when records merge. This is a PCI compliance requisite. Once you have reviewed the data points, select Merge Customer. You will see a popup warning. 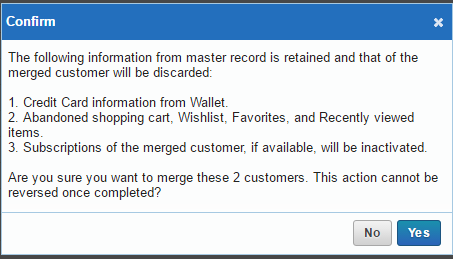 If you are ready to merge the two records, select Yes. This action cannot be undone. Orders for the merged customer record will be rolled over into the master record. You can only merge 2 records at a time; if the customer has multiple duplicates, you will have to merge each one.